If you are looking for a Spacious Home in a Beach Front Community, here it is! Randy and Donnas Beach House Surfside Beach, SC. An amazing 3400 sq. 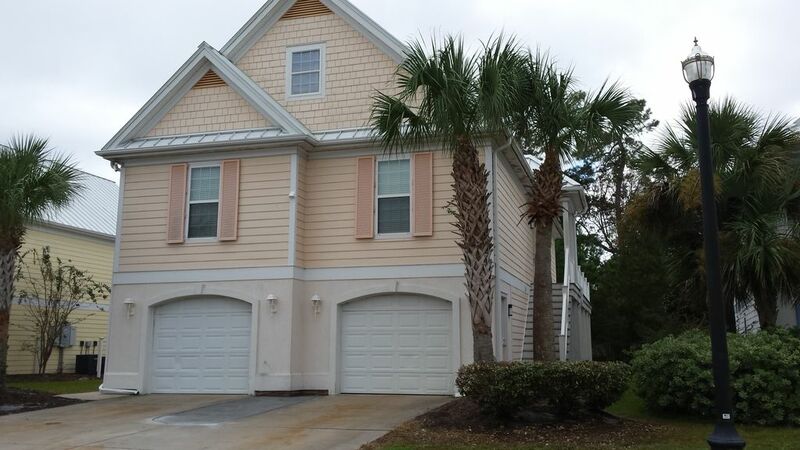 ft. 5BR 4.5 Bath Home (sleeps up to 15) located in Georges Bay inside the gated community of Oceanside Village in Surfside Beach, SC. WEBSITE PHOTOS ARE CURRENT. The overall home has 2 separate fully equipped kitchens, 2 separate dens, each with a wall mounted flat screen TV, 2 separate laundry areas each with full size washer/dryer, a sun room, a game room and 2 decks, 1 covered and 1 open sun deck. Cable and Wi-Fi included. Starting with the amazingly spacious open area on the second floor you have the Den, Sunroom Seating Area, Dining Area, Kitchen, Laundry and 2 Bedrooms and 2 Baths. Fully equipped kitchen with eat in bar for 4, dining table to easily seat 8 or more, plus a wicker table and 4 chairs in the sunroom for card games, reading etc. Deck with picnic table and chairs is just off the sunroom. Master bedroom has a king bed and a full bath with a huge walk in shower with bench seat, double vanity etc. Also on the 2nd floor is a queen bedroom with a full bath just across the hall. The 3rd floor is a private 1BR 1Bath portion of the home where you will find a bedroom with 2 full sets of double bunk bed over double bunk bed which easily accommodate 6 people along with a full bath. On the ground floor we have a complete 2BR 1.5 Bath living area with Den, Kitchen, Dining, Full Laundry area and covered porch just off the den. One of the Bedrooms is a queen and the second Bedroom has a full set of double bunk bed over double bunk bed which easily accommodate 6 people. Again, total of 5BR 4.5 Bath spaciously arranged so everyone has their own space. In the ground floor garage you will find an Air Hockey Table, Foosball Table, various beach toys, chairs PLUS 2 golf carts for use by adult licensed drivers only. As you see in the photos, there are plenty of activities throughout the gated community to include tennis, basketball, horseshoes, volleyball, Ball-field, Kids Water Play Area, 2 Outdoor Pools, 1 Indoor Pool and more plus. We do provide all bed and bath linens at no extra charge, we ask that all bed & bath linens be washed folded and placed back at the foot of each bed before departure, bath linens be placed back in the bathrooms. If you would rather have an Outside Bed & Bath Linen Service, that can be arranged and added for a fee based on the number of guests in your group OR you may bring your own. As for cleaning, you will not be charged a departure cleaning fee provided you leave the home in "as you found it condition". If you would rather have an outside service provide your departure clean, that can be arranged for an additional fee. Over the last 10 years, 90% of all guest have opted to take care of bed and bath linens themselves and have welcomed the idea to save on extra fees. Three minute ride on the golf cart gets you to the beach and the Conch Cafe restaurant also on the beach front. Private parking for your golf carts directly adjacent to the Conch Cafe. Oceanfront parking area has showers and rest room facilities available. Ponds around the property where the kids can feed the ducks and even fish! Grocery store, shopping, golf - five minutes away off Hwy. 17. About 20 minutes from Broadway at the Beach in North Myrtle Beach. Awesome flea market about 5 min. away, waterslide park, so much fun things to do. 8.9 miles from Myrtle Beach Airport (16 min. drive). There's a WalMart Supercenter 1.8 miles south right off Hwy. 17 to save on groceries. For additional golf cart rentals contact Golf Cart Rental Office next door to Management Office. Must be 25 or older to rent this property. NO PETS! NO SMOKING! JUNE, JULY AND AUGUST rental window is Saturday arrival and Saturday departure. OFF PEAK RENTAL WINDOW CAN BE FLEXIBLE. Bed linens are provided at no extra charge provided they are washed, dried, folded, returned to the bedroom dresser prior to departure OR they can be provided at a cost based on number of guests. Bath Towels are provided at no extra charge provided they are washed, dried, folded, placed on the bathroom counter prior to your departure OR they can be provided at a cost based on the # of guests. Fitness room and equipment within the property grounds, small access fee required for use. Property has a public use indoor pool, 2 outdoor pools and kids water play area. Hot tub is located adjacent to the outdoor pool. Both dens (large seating areas) in the home have large wall mounted flat screens TV's. We do provide a charcoal grill for those wanting a little outdoor cooking. You can also enjoy the GAMEROOM which has a FOOSBALL TABLE and AIR HOCKEY TABLE. We also provide 2 GOLF CARTS for your convience. We provide you with all of the luxuries of home: Wireless Internet, Central Air, Ceiling Fans, Cable TV, Ice Maker and Coffee Makers. Bed Bath linens are provided. Sorry No Pets Allowed...No Smoking Allowed Indoors or in the Garage..... Smoking is allowed outside on back porch, deck or patio Only. We loved staying at this house. It was clean, well-equipped, and beautifully furnished. The golf carts made getting our large group to the beach fast and easy. The owners were very friendly and responsive. I highly recommend this vacation home. The house is designed to accommodate multiple families very comfortably; including an living/dining area where all families can gather for meals, etc. and also living spaces away from main gathering place that provide a respite from family activities. The house is conveniently located close to retail establishments ... food, ice cream, putt putt, restaurants. A large community with tennis courts, playground, indoor pool, outdoor pool (fantastic kids area). No bike paths, but riding around the community was still nice. The two golf carts that were provided and our bikes we brought with us got us everywhere we needed to be! Super fun vacation! Great place and very accommodating! We enjoyed our week long stay and had everything we needed. We would definitely recommend his home to anyone! We enjoyed the property very much! The home is beautiful and with the golf carts just a couple minutes to the beach and a minute to the pools! Many family memories made here and will love to rent the beautiful home again for any future visits! Thank you for an amazing place to stay! The home was very nice we enjoyed ourself. The home was equipped with everything you need down to beach equipment. Everything was lovely. Close to the beach also. Very beautiful home. We really enjoyed our stay. Very accommodating home for a big group. Kitchen was well stocked with pots and pans so we were able to cook. Don’t pass up the opportunity to stay here!! Our beach house is the perfect vacation rental in a family community offering private beach front access, oceanfront dining, close to shopping, family fun, entertainment, Tupelo Bay Golf Course just across the street & more than 30 other golf courses nearby. There is always great deals on golf to be found. Nearby Murrells Inlet is home to Fishing, Charter Boats, Watersports & many great restaurants. The Grand Strand Area of Myrtle Beach has more than 2000 Restaurants serving every cuisine under the sun. The area has an abundance of nightlife and entertainment such as Carolina Opry, Alabama Theatre, Dolly's Pirates Voyage, Ripley's Museum, Hard Rock Cafe and Broadway at the Beach.